This is the Middlesex Centre Council meeting agenda for January 23, 2019. You can find the full agenda here. Today I will be focusing on the Delegations, Presentations & Petitions, Consent Agenda, Staff Reports, and Committee of Adjustment. I already wrote about the Public Meetings affecting Ward 4 a few days ago. First up we have a very confusing situation that, as far as I can tell, involves a man named Fred Lewis who was one of the vendors and also a beneficiary of municipal drain work completed and he is requesting a refund on penalties paid. I have all sorts of questions that will need to be asked to ascertain exactly what happened, when, and why. The refund request will be voted on later in the evening. Next, Middlesex County CAO Bill Rayburn will appear before Council to discuss the CAO recruitment and hiring process. There was a desire during the prior Council meeting not to use a third-party vendor, and instead to leverage existing resources that understand the Middlesex Centre’s needs better. Lastly, Kevin Moniz from Strik Baldinelli Moniz will appear to present his report on the Martin Drain. There are lots of parties involved, and even the municipality stands to benefit from some of the works proposed. Under the consent agenda we have three items to review and receive (or not). The budget to date for December 2018 still has a number of gaps remaining because routine reserve transfers haven’t been completed, some bills haven’t been paid, and so on. However, there still appears to be a fairly large surplus that could be used in a number of ways. I’ll be seeking some clarity both before and during the meeting. We have a more detailed report on the CAO hiring process, including a list of costs for posting the position to various job boards, and a list of qualifications that hopefully suits our needs better. For example, the educational preferences have been expanded to allow for a wider pool of candidates! The number of calls MCFS attends to has been increasing, primarily driven by monitored alarms, open burning, motor vehicle collisions (MVC’s) and tiered medical responses. Population increases are also driving the number of calls higher, which is to be expected. 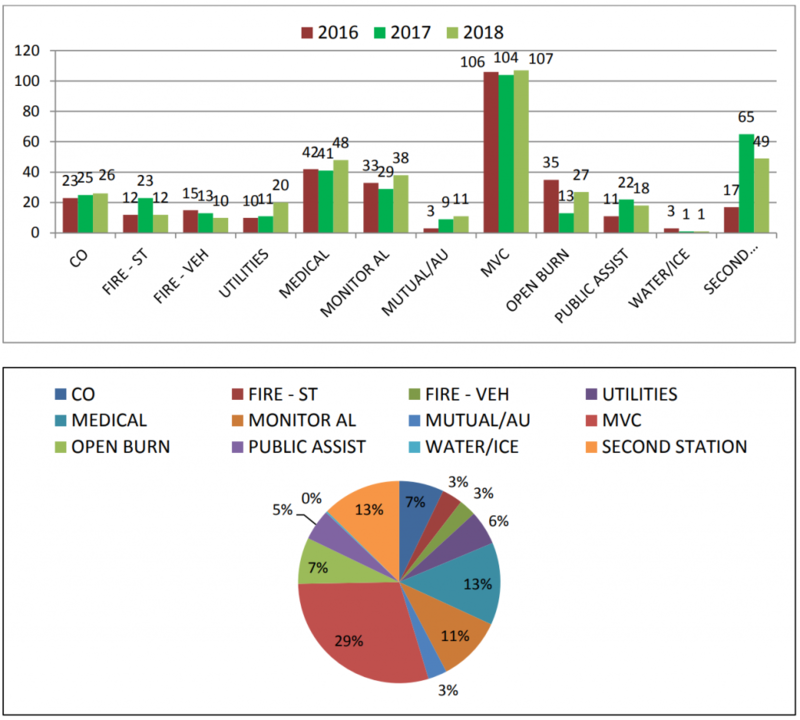 On the other hand, the number of structural fires dropped by almost 50%, from 23 calls in 2017 to 12 calls in 2018! Delaware Fire Hall, which is the primary for Komoka and Kilworth, responded to 133 calls in 2018. That’s a 36% increase! The dollar loss value for 2018 is $2.9M, the lowest it’s been since 2015. Hopefully we see another reduction in 2019 through fewer and smaller fires. I also encourage you to review the impact our educational components had in 2018 (pages 5 and 6). The County’s Fire Prevention Staff have reached at least 25,212 through their efforts! The Fire Prevention staff also conducted 12 fire safety/fire prevention demos/lectures, 6 fire drills and attended 43 meetings on behalf of Middlesex Centre. Nice work! We have been utilizing Selectpath to supplement our HR needs for the past few years, but staff have identified a number of deficiencies that must be addressed in order to keep things humming along and to remain within legislative boundaries. After our previous Municipal Engineer left the Municipality, and the CAO shortly thereafter, Council decided to hire a new CAO first. As a result, we have a need for a temporary appointment until we hire a new, full-time engineer. IBI Group would be represented by Rob Casacden, who possesses his Professional Engineer (P. Eng.) designation. This is an item identified last fall. Staff is now looking to proceed before the weather makes these repairs far more difficult. I am of two minds on this issue, but I look forward to a healthy dialogue with Council and the Fire Chief. Having just completed an educational session on drinking water quality and safety, and reviewing the operational plans, I only have a few questions for staff and otherwise am satisfied with the plans put forth. And to approve the application for temporary Zoning By-law Amendment, to allow Kevlar Landscaping 18 months at 85 Queen Street while they search for a new location. I put forth this motion at the last public meeting, so I’m looking forward to giving Kevlar some reprieve and time to breathe. This is outside of Ward 4’s boundaries, but I wanted to highlight it because it is a rare recommendation for denying the request from our Planning staff. This is also the first Committee of Adjustment meeting that I will chair. The request is to be allowed to erect an accessory building with a maximum size of 511 m² (5500.36 ft²). The Comprehensive Zoning By-law permits a maximum size of 50 m² (538.2 ft²) for an accessory building in the Existing Use (EU) zone, which is the zoning for this property. And that’s that! If you’re interested in the items under Committee of Adjustment and Public Meetings, please be at Council Chambers at 10227 Ilderton Rd by 19:00 (7pm).